BC Studies welcomes advertisers looking to connect with our subscribers. BC Studies has 400+ print and electronic institution and individual subscribers in Canada and internationally. Our readers are highly educated, loyal, and interested in a wide variety of contemporary issues. 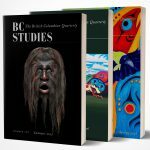 With a solid reputation for authoritative and informative content, BC Studies is enjoyed by academics and general readers alike. For information on publishing dates, ad copy details, or to receive our media kit please contact our Sales and Marketing Assistant. Book Multiple Ads and Save!